Anxious brides. Drunken businessmen. Panicked partygoers. As Bigtime, New York’s premiere event planner, Abby Appleby is capable of handling almost any crisis, but even she’s not prepared when she finds herself in the middle of a fight between superhero Talon and his ubervillain nemesis Bandit. Abby manages to save Talon, but the superhero is temporarily blinded, so she takes him back to her loft, where the two wait out a snowstorm. During a blizzard that shuts down the city, Abby and Talon grow close, and he starts calling her Nightingale because of her love of music and singing. The Bigtime Superheroes series is, as described on Ms. Estep’s website, “book candy.” We really feel this is a great description of this e-book series. If you love comic books, superheroes and ubervillians, then you really should check out this series. Gikany and Una started, by chance, with A Karma Girl Christmas. We enjoyed the story so much; we were pleasantly surprised to be able to have a chance at reviewing the latest book in the series, Nightingale. Abby is your dependable gal Friday. She always makes it happen, never lets anyone down and gets the job done. Despite all her hard work and determination, she is very good at being behind the scenes. She feels invisible, unlike the high society darlings, she feels like a wallflower that just blends into the background — easily dismissed and overlooked. Poor Abby has given up on love – between her super senses and being so average – she has thrown herself into her business. However, everything changes when she has a chance encounter with Talon – one of Bigtime’s superheroes. Talon is not like most of the superheroes in Bigtime. He is not imbued with super senses or healing powers and can’t fly. He is a gadget superhero able to help fight off ubervillians with his intelligence and powerful gadgets. However, he is overwhelmed in an alley, shot and at the mercy of the ubervillan, Bandit, when Abby comes to his rescue. The story then takes off between Abby and Talon. It is a delightful story completely told from Abby’s point of view. The twists and turns that Abby and Talon take could be frustrating but they are completely tempered by the enjoyable characters and colorful world that Ms. Estep has created. Although there are plenty of clues to figure things out, the actual course to get there is not straightforward. Nightingale kept us on our toes, and rooting for both Abby and Talon. It was a gripping read simply for its entertainment and joy. 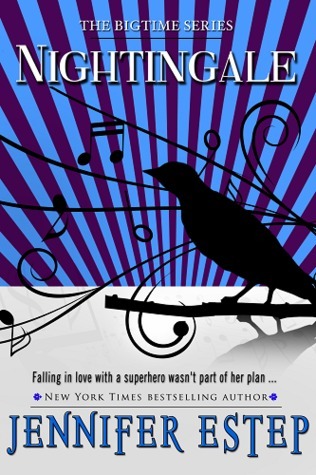 Nightingale is a quick, fluffy and most enjoyable read. Gikany and Una delighted in the lightheartedness of it. The Bigtime Superheroes series is a wonderful blend of comic superheroes, regular people/characters you can certainly relate to, and a mystery plot to solve. As a side project of Ms. Estep’s, we truly appreciate the time it takes to self-publish something that is so very enjoyable as a treat for her readers. If you haven’t had the chance to pick it up, give it a try. We jumped in on the series and have not felt that we have missed out on anything, except maybe a fun story. I LOVE Estep’s Elemental Assassins series so when I saw this series at my local used book store I grabbed bks 1-3 and I have this one setting on my Nook. Once I’m done with the EA series I’m jumping into this one.